Jack Welch once said, "Someone, somewhere has a better idea." In this myth-busting book, the authors reveal that great business ideas do not spring from innate creativity, or necessarily from the brilliant minds of people. Rather, great ideas come to those who are in the habit of looking for great ideas all around them, all the time. Too often, people fall into the trap of thinking that the only worthwhile idea is a thoroughly original one. Idea Hunters know better. They understand that valuable ideas are already out there, waiting to be found - and not just in the usual places. 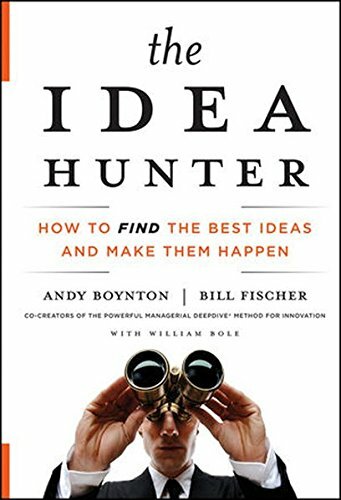 · Explains why ideas are a critical asset for every manager and professional, not just for those who do "creative"
The book is filled with illustrative accounts of successful Idea Hunters and stories from thriving "idea" companies. Warren Buffet, Walt Disney, Thomas Edison, Mary Kay Ash, Twitter, and Pixar Animation Studios are among the many profiled. 2. Don’t let the job, company, or industry define your Hunt for ideas. You want ideas that stand out, and to get them, you have to chart your own course. That means creating your own collection of information and idea sources, different from the sources being tapped by everyone else in your business. Don’t fall victim to the plague of “me too” ideas. 4. Be a “T” rather than a purely “I” professional. The “I” type (think narrow and tight) is deeply versed in a specific area of expertise, while the “T” professional (think extended and broad) has a greater breadth of skills and interests. Both types of professional have much to offer, but “T” people are better at fostering the diverse connections and conversations needed to bring exceptional ideas to the surface. 10. Focus on “Try-ability.” Make it easy for people to try out your idea, before buying into it. Think like Apple, which lets people listen to 30-second snippets of music on iTunes before they buy a track or CD. Customers and colleagues are far more likely to sign on if they’re less worried about making a decision they’ll come to regret.